Cupertino, CA, United States (AHN) - With an alliterative nod to its popular iPod music and video playing devices, Apple on Wednesday unveiled the iPad, a touch-screen tablet computer. Chief Executive Steve Jobs introduced the device, shaped like an oversized iPhone, at company headquarters that had been anticipated for weeks by Mac fans and the media. The Wi-Fi-capable device contains a 1-gigaHertz chip, with more than 16 to 64 gigabytes of Flash ram. Like Apple's popular iPhone, the iPad runs Apple Store applications. Jobs said the tablet was designed with the environment in mind. It's highly recyclable as components are free of arsenic, BFT, PVC and mercury. The device can display full-size Web pages and its keyboard is nearly the same size as that of a desktop computer. Users can read books on its display, watch videos or play music. Potential sales for the iPad could be in the millions. In the first year the iPhone and iPod were released, each sold about 6 million units. Even before its release, analysts were saying the tablet could be a rival to Amazon's Kindle book reader. On Tuesday, Apple said it made $15.68 billion in the first quarter of fiscal 2010, with a net quarterly profit of $3.38 billion. A year ago, the company had revenue of $11.88 billion and quarterly profit of $2.26 billion. Immediately after Wednesday's announcement, Apple (AAPL) was down 1.4 percent to $203.06. There’s a very custom interface that I won’t bother describing — we’ll put video here as soon as Apple puts it up. Needless to say it’s very good looking. 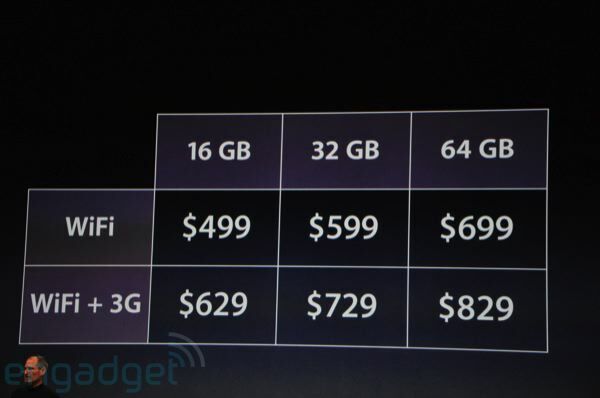 Prices start at $499 for 16GB, $599 for 32GB, $699 for 64GB. Adding 3G costs $130. We’re seeing lots of great-looking apps from the live coverage of the event, including 3D games, a really sweet-looking calendar, a nice email app, and a New York Times app that looks really stunning. Our minds all just got blown by the $499 starting price. I was thinking way more for sure. Nice move, Apple. More photos of the press release here.